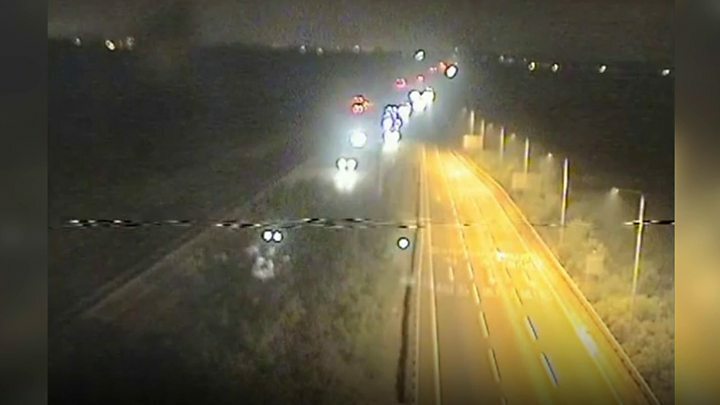 A fatal minibus crash on the M1 "laid bare the loophole" where employers are not automatically told of drivers losing their licence, a charity said.Eight minibus occupants were killed in the crash in August caused by two lorry drivers - one of whom had lost their HGV licence 37 days earlier.Road charity Brake said the government should "urgently" look at the law.The Department for Transport denied there was a "loophole" and said it was an issue between employer and employee.Seven Indian tourists and Nottingham-based minibus driver Cyriac Joseph were killed in the crash on the M1 near Newport Pagnell, Buckinghamshire, on 26 August. AIM Logistics, which employed one of the lorry drivers found guilty over the crash, Ryszard Masierak, said after the conviction that all its drivers were subjected to checks as regular as the DVLA suggested.The duty is on the employers to check their employees' licences regularly, with the DVLA advising it should be done every three months. Evesham-based AIM Logistics said Masierak had his licence checked in June 2017.However, it said neither the employee nor the DVLA informed the firm he had it revoked on 20 July - more than a month before the crash - after he failed to re-arrange a date for a driver conduct hearing for committing "drivers' hours offences". In the intervening period between his licence being revoked and the scheduled next check, he stopped on the inside lane of the M1 while twice the drink-drive limit.Another lorry, driven by David Wagstaff, forced the minibus underneath Masierak's stationary lorry, killing eight people and seriously injuring four others. Charity Brake said: "This crash has had a truly devastating impact and laid bare the loophole in which employers are not automatically informed if their drivers lose their licence. "It is only right that we learn from such tragedies and prevent other families from suffering a similar fate, and so we call on the government to urgently look into this matter. "The Royal Society for the Prevention of Accidents said the current rule relied upon the "honesty of the driver".Road safety manager Nick Lloyd said: "It does seem to be a loophole that could allow drivers to avoid losing their driving job after a ban because they don't tell their boss, at least until an organisation does its regular online licence check." The Department for Transport said the additional regulation would be unnecessary and burdensome on small businesses.It added employers should encourage employees to notify them of any change in their driving status.A spokeswoman added: "This is a tragic case and our sympathies are with the friends and families of the eight victims involved. "Last month Masierak, from Evesham, was jailed for 14 years for causing death by dangerous driving, while Wagstaff, of Stoke-on-Trent, was sentenced to 40 months in prison after pleading guilty to causing death by careless driving. Marstel-Day Environmental Consulting Celebrates Earth Day, Supports Earth Day Network's 2019 theme: "Protect Our Species."